I haven’t posted in a few-ish weeks (yikes!) I’ve started a bunch of posts, but then just didn’t finish them. Luckily she bit her tongue and didn’t tell her little sister what she saw. 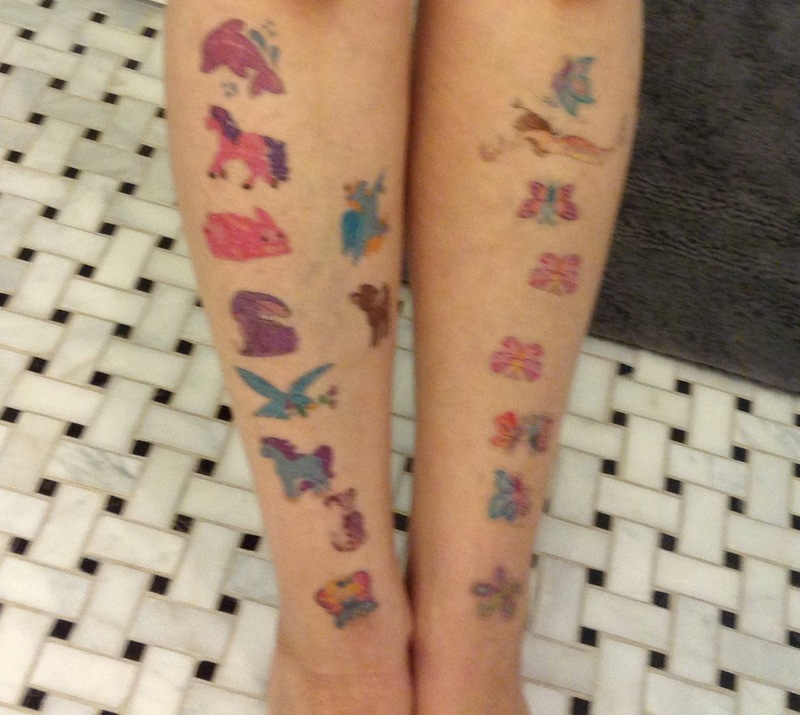 I wanted to tell you about how when I needed to get a revision done, I let my kids tattoo me for 15 minutes. They were surprisingly prolific. Sidenote, temporary tattoos stay on for a long time! Then John Cusick’s blog post yesterday kicked me in the pants. I just needed to start a post with whatever blergh came out of my brain. If I worried so long about what I was trying to accomplish with my post I was sure to accomplish nuthin’. Wow. I love getting critiques, but it feels really great to know I've contributed to 62 stories which may one day make their way into the world. 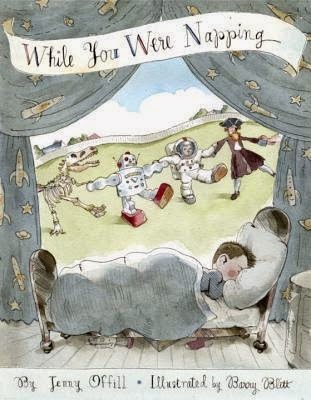 I also read a brand new subversive picture book called While You Were Napping by Jenny Offill and illustrated by Barry Blitt. I realized I had no idea which category it fit in from my subversive research in the fall. This delicious picture book features a big sister explaining to her little brother all the things he missed while he was napping in a way that only a real stinker of a big sister can do. It’s terribly inappropriate (babies light fireworks), but so good. 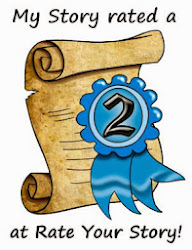 Two lovely bloggers nominated Lauri’s Stories for the Very Inspiring Blogger Award. Please visit their fabulous sites. If you like MG and YA, Leslie Zampetti is a librarian who does great video reviews. If you like people who spell their name's L-A-U-R-I then you have to visit Lauri Fortino's Frog on a Blog. Thank you ladies!! Ahhh. This post was rambling and disjointed, but it was a start! Here’s to a 2015 with lots of action and less worry about whether the action is the perfect one for this moment. Thanks for another pb to add to my list! I loved her book Sparky! so I'll bet this one will be just up my alley! Oh gosh it's a miracle that hasn't happened in our house yet but I don't get tattoos. My youngest loves them too much on herself and putting huge stickers on her bedroom wall. Way to on critiques! Well, yeah I was a closet snoop too- but I didn't let my mom find out! Thanks again for the VIB award. Man, I'd hate to guess what you would have to do if you needed an hour to revise. Um, yeah, me too. This morning I tried to do a few things while they insisted on creating static electricity in my hair with fleece pillows. Little one starts kindergarten next year though! Never heard of this books, Lauri, and I'm so surprised you didn't like that tattooed look. It's so stylish! ;) Also, I didn't know Leslie did VIDEO reviews! Thanks Erik - You know you never take a break AND you have schoolwork AND you have to be a teenager. Your days must be packed! !